Rising concern about food safety and quality is resulting in the higher demand for safe, healthy, and safe products in the dairy products packaging market. Also, the shelf-life of dairy products on physical interaction between food and package. Hence, companies in the dairy products packaging market are taking innovative approaches in technologies to preserve food for a long time. The intelligent packaging system is capable of winding up intelligent functions including sensing, tracing, detecting, recording, and communicating. This system in dairy products packaging can help to improve quality, enhance safety. With intense competition and complex supply chain globally in the dairy products packaging market, companies are deploying innovative solutions to provide better protection and safety. Time-temperature indicator, color indicator, leak indicator, freshness indicator are some of the indicators being used in intelligent packaging systems for dairy products packaging. The companies operating in the dairy products packaging market are also using radio frequency identification tags (RFID) to incorporate a large range of information. Manufacturers in the dairy products packaging market are also focusing on combining the RFID system with responsive material to provider information on the quality of food within the package. In recent years, dairy products packaging manufacturers have started providing on-the-go packaging for consumption offering convenience. Increasing number of households especially in the developed countries consists of only two or three members in the family, hence, consumers are looking for smaller and single-use dairy products packaging. Manufacturers in the dairy products packaging market are launching portable single-serve bottles, squeezable and stand-up pouches in response to the increasing demand for on-the-go packages. Dairy products packaging manufacturers have started offering resealable and reclosable packaging. As per the Tetra Pak study, portion packages under 250ml are likely to witness worldwide demand in 2019, which is expected to go up by 10% as compared to the current volumes in dairy products packaging. Effective dairy products packaging can help to reduce food wastage by increasing shelf-life of food products, thereby, making it safe for consumption for a long period of time. Manufacturers are launching new dairy products packaging with a re-closable format that make it easy for the user to pack the product and keep it safe to be consumed for a prolonged time. Meanwhile, multi-layered barrier packaging in the dairy products packaging market keeps the oxygen and moisture away delaying the dairy product degradation, this is resulting in increasing use of multi-layer barrier packaging in the dairy products packaging. According to the Food and Agricultural Organization of the United Nations, around 12-25% of dairy products are wasted in various regions worldwide. Milk and other dairy products manufacturers are also using aseptic dairy products packaging, providing a sterile environment and increasing shelf-life of products. Focusing on providing eco-friendly options, companies in the dairy products packaging market are using recyclable materials that result in reduced carbon footprints. Dairy products packaging manufacturers are also using green packaging solutions to show it as a symbol of eco-friendliness, thereby, attracting more customers. In an effort to go greener, by providing green packaging solutions, manufacturers in dairy products packaging market are providing light-weighing dairy products packaging by making the wall of packages very thin without compromising on product quality and safety. Meanwhile, dairy product manufacturers, especially in case of milk, are using glass containers. Glass being the most recyclable material can be used for a number of times in dairy products packaging, it also results in less energy and raw material usage. Meanwhile, green milk packaging made using cardboard pulp accounts for less carbon footprint as compared to bottles made using High Density Polyethylene (HDPE), this is resulting in increasing use of cardboard pulp in dairy products packaging market to produce packaging for milk. New packaging technologies in dairy products packaging market are reaching new heights by transforming the way food and dairy products are served and consumed. Innovative packaging technologies including edible packaging, lightweight packaging, anti-microbial packaging, and multi-sensory packaging are gaining popularity across the food and beverages industry. As a part of edible packaging in dairy products packaging market, researchers at the American Chemical Society (ACS) have introduced eco-friendly film made using milk protein casein for dairy products packaging. The film helps to keep oxygen away from food and it is completely edible and biodegradable. Meanwhile, researchers are also planning to add vitamins and probiotics to the mix for dairy products packaging to enclose the product in nutrients. 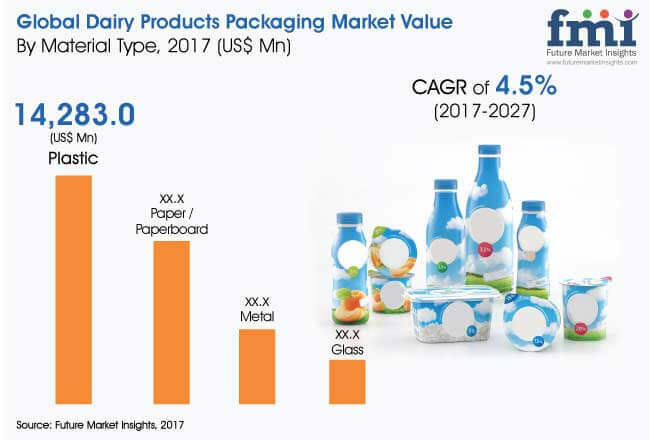 With the introduction of new technologies and materials in dairy products packaging, key players in the dairy products packaging market are focusing on providing innovative packages. Companies operating in the dairy products packaging market are also entering into partnerships and mergers and acquisitions to establish themselves across various regions. For instance, dairy products packaging companies such as Amcor and Huhtamaki are planning to acquire Essel Propack Ltd. Moreover, Essel Propack in 2015 sold its wholly-owned subsidiary Packaging India to Amcor Flexibles India. Meanwhile, Sonoco, another company in the dairy products packaging market has completed the acquisition by acquiring 70% in Conitex Sonoco joint venture. Sonoco is focusing to set strong manufacturing presence in emerging markets in Asia and doubling its annual sales in the region. Sonoco is also planning to increase prices of all rigid plastic packaging in the US and Canada by 6 to 10% in response to strong regional demand and rise in other materials and freight. The dairy products packaging market report also provides detailed profiles of all the other leading market players. The research report on global dairy products packaging market follows a research methodology which takes the data and analysis to almost 100 percent accuracy by following a unique process where the data collected is verified multiple times and this evaluation is simultaneously validated persistently by experts in the dairy products packaging market through conducting several primary interviews. The information gathered undergoes number crunching by applying a triangulation method. Additionally, analyst support is offered which can be used to resolve any queries regarding number crunching, regional breakdown, subject matter understanding and market definition, or any other query from a technological standpoint. The research process is an extensive and systematic method to glean relevant market data and statistics and each data point gathered from this process resembles the scenario of a particular segment in a particular region giving the reader an idea associated with the growth of the segment in the coming years. The analysis of competitors’ strategies such as pricing, promotion, growth, their revenues, market hold, etc., is included in the global dairy products packaging market research report. It covers the entire competition ecosystem along with supplier analysis. It also provides data and statistics on the changing market environment and the tactics opted by these players to cope up with the changing market scenario. A separate section is dedicated to competitive analysis in the global dairy products packaging market research report that covers key players participating in the dairy products packaging market. Weighted market segmentation is carried out to fully analyse the global market for dairy products packaging. The market research report on global dairy products packaging market enables the reader to explore and analyse the market with different perspectives and angles. The researched data will help the reader to deliver and grow by enhancing processes and formulate effective strategies. A broad view of the dairy products packaging market will support the company right from the conceptualisation or ideation phase to commercialisation. This research report provides a barrage of insights which identify revenue pockets, potential prospects, key strategies, etc. The research report also covers market shares, volume and value analysis, vendor or supplier analysis, pricing analysis, key regions, market growth drivers as well as threats and opportunities. The research report on global dairy products packaging market is systematically and skilfully designed that starts with an executive summary followed by overview and market definition, segment analysis and more importantly the forecasts that can influence the strategic decisions of a company based on the future market scenario. The research report on global dairy products packaging market also includes key recommendations which can be used to gain a higher degree of visibility of the market in the coming years. 17.6.11. Berry Global Group, Inc.
17.6.16. KOROZO Ambalaj San. Ve Tic. A.S.